Your high-end clients or commercial builds demand durability that doesn’t sacrifice style. However, practical and durable doesn’t necessarily need to be basic or boring. One cost-effective way to add interesting accents is to use traditional construction materials in non-traditional ways. Natural stone thresholds are one way to achieve this. Typically, they’re necessary elements for creating safer transitions as well as shower enclosure boundaries that are appealing and effective. 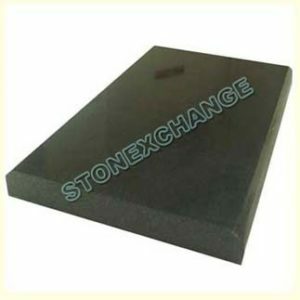 Since purchasing such materials in bulk at wholesale prices provides you with plenty of stock, you can make your existing inventory perform double-duty with decorative design ideas using Absolute Black Granite thresholds. Why Select Absolute Black Granite? Polished black granite lends a decorative element that’s bold and modern. Since darker building materials suffer defects better and are easier to clean and maintain, they work in places that lighter stone or wood can’t. Whether you use Absolute Black Granite to tie-together a monochromatic color scheme or as a contrast, the end results are spectacular. Our black granite thresholds are ADA-compliant and available in widths of 2, 4, 5, and 6 inches, with a standard length of 36 inches; they feature a 1/4-inch Hollywood bevel on each of the two long sides. You can purchase the 2-inch thresholds with a 3/8-inch thickness in containers of 100 – 200; all other widths are available in 5/8-inch thicknesses in units of 50 per box. We can also make custom thresholds to order, but it may take longer to process and fulfill your request. Read on to learn some unique ways to put your Absolute black granite thresholds to use. A fireplace is already a focal point of any room it’s in, but you can make it even more spectacular without seeming overdone. Contemporary fireplace design often means stone hearths that are flush with the floor, and Absolute black granite offers a stunning transition that separates the hearth area from your flooring. Continuing this minimalist trend, consider installing a slim mantle of threshold material, or bordering the entrance to the fireplace insert with a rim of black granite; with four widths to choose from, it can be as subtle or as bold as you want. This is a stunning look with a white marble or stone fireplace. Marble and other decorative stone materials have been used as features in mosaics and large slab wall hangings dating back centuries. Adding a bit of interest by bordering an oversized wall display in highly polished black granite lends a stately elegance that’s perfect in an executive boardroom, luxury home, or large reception area in a hospitality or office setting. Who needs a traditional frame when you can have a luxury stone? Granite shelving is not just for housing soap in your shower stall. Consider recessed black granite shelving over a backsplash in a white and stainless steel kitchen or to line a decorative nook in your entryway. The 2- or 3-inch width could be used to support spices, and the larger sizes can hold candles, nick-knacks, or framed photos. In most settings, thresholds are used to provide a safe transition from indoors to out, in main entryways, or into rooms where there is a slight difference in floor height. However, in cases where there is a difference in flooring material—from wood to carpet or tile, a threshold makes that transition appear less awkward. Absolute Black Granite looks especially exquisite when used with white marble or with a vintage black and white checkerboard floor design. It can also be used to mark the entrance to a formal dining room or solarium. Threshold materials don’t necessarily belong on the floor. Black granite pieces add a bit of interest when it’s installed as a lip or ridge around the top of a custom marble tub or granite countertop. Absolute Black Granite can also be used to cap a half wall or as a border tile to create a transition on a wall that’s painted in two colors or half painted and half tiled. In fact, anywhere that you might install a baseboard, a bit of trim, or a border, you can substitute a black granite threshold instead. Stonexchange depends on providing you with superior products and services, and that’s something we take seriously. We strive to provide a true one-stop shopping experience that extends from manufacturing to importing, and then delivering select quality merchandise right to your warehouse or building site. Our granite, marble, and natural stone window sills and thresholds are in high demand by our clients, and we believe that they deserve the best. Our 18,000 square foot warehouse in Southern Florida allows us to keep a large stock on hand that’s ready to go when and where you need it. Because we control the supply chain and the quality, buying in bulk directly from us means that you’ll have a steady supply of product to meet the demands of your business. You’ll also appreciate interacting with our knowledgeable staff of decorative stone experts. At Stonexchange, We are Fully Stocked! We have thousands of units of competitively priced stock in our inventory at all times, and accommodations can be made for extra large or special orders. We’re committed to forging long-standing relationships with builders, retailers, and design houses, and we can’t wait to add you to our growing list of satisfied customers. For more information or to place an order, contact us at 305-731-2400. We’re open for business and ready to serve you Monday – Friday, 9am – 5pm.